An Italian-made module that will give the International Space Station a float-in closet and help ease the outpost's storage woes arrived at the launch pad this morning for loading aboard space shuttle Discovery. The Permanent Multipurpose Module has visited the station seven times already as the "Leonardo" reusable cargo hauler. But since its most recent flight in April, ground crews have modified and armored the cylindrical vessel for its new role as a long-term fixture in orbit. "There's no intent to go live or work inside that module -- it's the pantry, the garage, the place to put things away. It really solves a growing problem on the ISS. We always knew we were going to have to carry a lot of supplies. 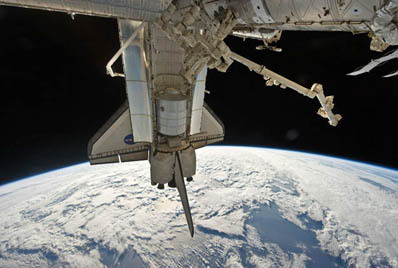 With the end of shuttle program, however, we realized we needed to preposition a lot of things. This gives us more flexibility to do that." Transforming this module, which astronauts liken to a U-Haul truck, into a permanent piece of the International Space Station has involved extensive work to ensure it can withstand the orbital environmental over many years. "It was a crash effort, for one, because we started the thought process just about a year ago. And that's awfully late in manned spaceflight. So we got a late start and we had several key things to make it viable to stay on the station. The biggest thing was modifying the exterior where necessary to armor it up a little bit more to protect from micrometeoroid debris impacts," Higginbotham said. Although the module already had shielding for the short-duration missions, safety rules said more protection was needed to absorb hits by tiny space debris throughout the station's life. The solution was making the multi-layer insulation sandwiched between the metallic outer skin and the module's pressure hull into a bullet-proof vest. "We and the Italians came up with the same idea at the same time, and that was rather than modifying the metal shields, which were preexisting and would be expensive and heavy, change the insulation that actually goes underneath the shields," Higginbotham said. The Donatello module, the third of three reusable vessels built by the Italians but never flown, was stripped of its insulation late last year and the blankets shipped back to Europe. The material was upgraded and returned to Florida to wrap the Permanent Multipurpose Module this summer. "What they did is they built 50 mattresses, or multiple layers of Nextel and Kevlar, that are matted together and sown into an assembly and placed on top of the insulation. It was not done over the entire vehicle surface, probably two-thirds of the surface. And it was based on the geometry on where the module is going to sit on the station," Higginbotham said. The changes to Leonardo happened as soon as the module returned from its supply run to the space station in April. "We immediately had a crew on the inside doing destow of the cargo that came back and another worked externally taking all of the shields off and the (insulation) off," said Mike Kinslow, Boeing's payload flow manager. 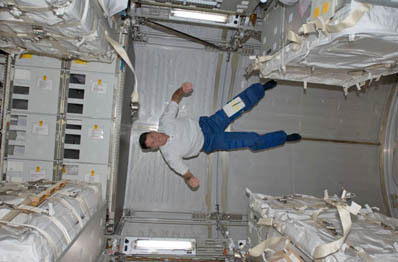 Other changes included loading new software and making internal wiring connectors more user-friendly for astronauts to handle in space, Kinslow added. And then the 11-ton module was filled with a variety of provisions for the station's near- and long-term needs. "It's got a mixed bag of things. Some of it will be used right away, some of it won't," Higginbotham said. "We have some critical spares we need to get on-orbit pretty soon. We have Robonaut, who is probably the biggest thing we are carrying up. And then there is the smattering of experiment supplies and normal spare parts and commodities that we would carry up on any MPLM flight. "I think there will be a wholesale repacking of the station when this arrives to take advantage of the space this now gives us. Some of the things that are going to be used in the near-term, like Robonaut, are going to be pulled out and moved over to the lab. And I'm sure some other things are going to be moved in." Current space station resident Shannon Walker, a flight engineer on Expedition 25, will help get the new module up and running. It will be mounted onto the station's Unity connecting node during Flight Day 6 of Discovery's mission. "Because just like most houses, you never can have too much closet space. So what we'll be doing as a station crew will be assisting the shuttle crew in attaching that module to the station, and then once the shuttle's gone, we'll be outfitting it and packing it full of the stuff that needs to stay there," Walker said. Upcoming station astronaut Scott Kelly, set to launch aboard a Soyuz rocket tonight from Baikonur Cosmodrome, added that the module is something the space station really needs. "It seems like the space station's really big but when you need all the stuff you need to live there for six months, it gets pretty full and having another module to help with stowage is critically important to improving our efficiency in doing our daily work on board." The other major payload Discovery will haul to the space station is the three-ton Express Logistics Carrier No. 4, a pallet-like deck to be hung outside the complex for storing external spare parts. 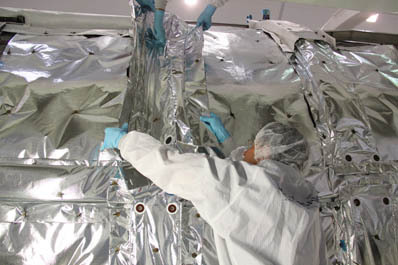 A replacement thermal radiator is folded up accordion-style on the carrier for launch on Discovery. Two other slots on the structure will accommodate a flex hose rotary coupler and a cargo container that fly up aboard a Japanese robotic resupply ship in January. "The thermal radiator is sitting on top, and that's about all we're carrying up. We have five empty sites on the bottom for future things, including the two that are going up on the HTV next year. They'll get mounted on the bottom side of this once they arrive," Higginbotham said. 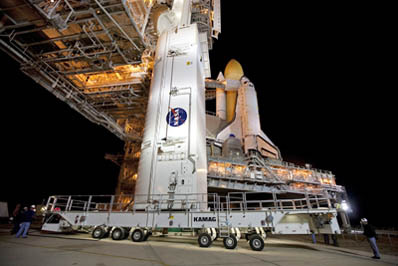 Discovery is scheduled for blastoff November 1 at 4:40 p.m. EDT (2040 GMT) for its final spaceflight before retirement. The all-veteran crew includes commander Steve Lindsey, pilot Eric Boe and mission specialists Al Drew, Tim Kopra, Mike Barratt and Nicole Stott. They'll visit Kennedy Space Center next week for the countdown dress rehearsal.